Rather than devote an entire month to subjecting myself to retro video games — which will never succeed, if history is any indicator at all — I’m going to simply revisit a classic game whenever the mood strikes. When my dalliances in gaming’s ancient past are noteworthy enough, you’ll even get to read about them here. Who knows, you might be inspired to go look in the local second-hand shops for a gem you missed when it was new. The subject of today’s Retro Game Review is 2003’s Ghost Master by Sick Puppies Studio, a small UK developer that was a division of Empire Interactive Europe Ltd. This somewhat unique strategy game casts you in the titular role of a Ghost Master, whose job it is to command a squadron of spirits as they haunt various locales in the town of Gravenville. You’ll hand-pick a team of ghosts for each mission you’re asked to undertake, and use them to accomplish your objective — whether it be to free a trapped spirit, punish a mortal for meddling in the supernatural, or simply scare everyone away. 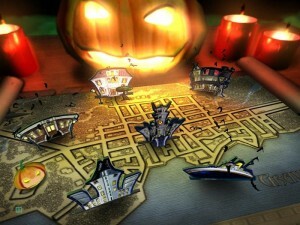 The map screen lets you choose your next locale to haunt. I had fun with Ghost Master when it first came out, but eventually I got bored of it and forgot about it. While waiting for the release of the new Ghostbusters video game on PC and consoles this past month, I was inspired to retrieve my Ghost Master disc from the closet and give it another spin. This time I’m having even more fun with it, and in just a few days managed to get much further in the game than I had before. It was such a good time, in fact, that I was inspired to write this post about it. When you first start the game, you’re quickly thrust into the world of “supernatural politics” that reminded me a lot of the spirit bureaucracy of Beetlejuice (and do you realize that’s two Beetlejuice references in two consecutive reviews on this site? One more and Michael Keaton will probably show up). Before embarking on your first haunting, you’re assigned a small cadre of ghosts who will do your bidding on the assignment. 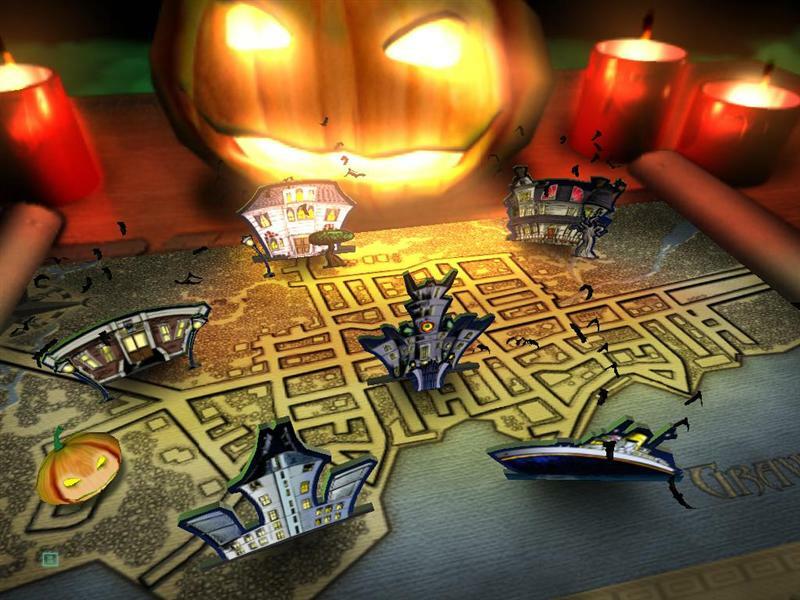 The map screen lets you select which part of Gravenville you want to haunt next, although at the beginning you’re guided into a tutorial mission to start you off. 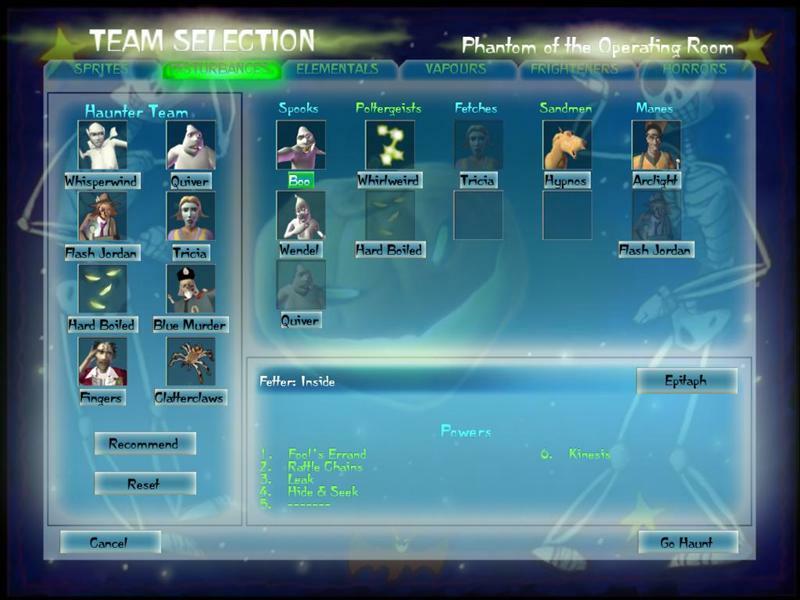 Next, on the Team Selection screen, you can choose which of your ghost team you want to accompany you on the mission. You’ll be presented with this same screen before each haunting, where you can either choose your own ghosts or let the game recommend a team for you. I typically find the recommendations sound, especially when you’re trying to free trapped spirits from the next level — more on that later. Here's where you pick your team of haunters before each mission. The meat and potatoes of the game’s presentation is very much like that of The Sims. 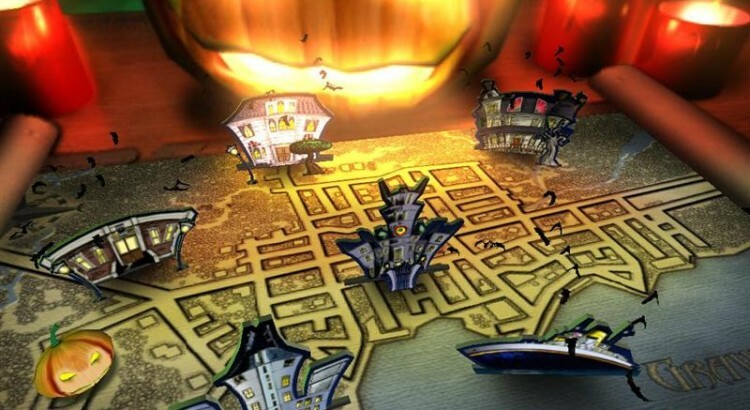 You’re given a three-dimensional view of your haunting locale, and the freeform camera controls let you use the mouse to rotate, zoom and pan around, as well as move between floors (in the case of haunting multi-story dwellings). In each locale is anywhere from a small handful to a large group of mortals — everyday humans to you and me — whom you will usually be instructed to scare away in blind terror. As you progress, the simple “clean house” objectives give way to more complex missions, some of which ask you to lead mortals into a trap you’ve set, or get them to perform certain actions at your behest. Actually haunting, of course, is the fun part. In order to manifest one of your spirits in the mortal world, you have to bind it to a “fetter.” Think of a fetter as a particular place or object to which your ghost is attached. To make things more interesting, each ghost can only be bound to certain types of fetters. The mischievous Boo, for example, can haunt anywhere indoors, but cannot go outside. Cogjammer can only infest electrical appliances. Other spirits, particularly those who met a violent and unnatural end, can only be bound to a corpse, or perhaps a “murder” or “violence” fetter. These fetters can be identified within the game world by a pale green outline; if you hover over it, you’ll see what kind of fetter it is. To make it easier, hovering over a particular ghost in your “army” will also highlight the fetters it can be bound to. Once you’ve bound a spirit to the mortal realm, you can unleash its powers. It’s here where Ghost Master really shines, because each spirit has a “banded” power system and a complex hierarchy of orders they can be given which, when combined, make for some pretty interesting effects. But you have to be careful, because using your powers spends “plasm points,” which you only earn by scaring mortals. If the mortals aren’t scared by your silly chain rattling or electric sparks, you’ll find yourself rapidly running out of energy. But if you can figure out the subconscious fears of your prey — each mortal has one — you can strike it like a chord and gain massive plasm points as you watch them shriek, faint or even go mad with terror. If you want to get more hands-on, you can use the “orders system” to give specific instructions to each individual member of your haunting team. You can ask a spirit to pick on a certain mortal, roam freely, or even use only a particular power (and then only when a certain type of mortal is nearby). This becomes very useful later when you have more detailed instructions to carry out, and can also aid you in the task of freeing trapped spirits. You can find several trapped spirits in each locale - like Tricia here, who's trapped in a mirror. Speaking of which, each locale you haunt is home to anywhere from one to four trapped spirits, which are bound permanently to some part of the map unless you free them. You’ll have to figure out the particular action — or chain of actions — that will free each spirit, although if you talk to these ghosts first, they’ll usually give you a few clues. If you succeed in freeing a spirit, it will join your team and become available for you to use throughout the rest of that haunting, and in any future haunting as well. The more spirits you can free, in other words, the more well-equipped your hauntings will be. The locales are pretty well varied and creative, and most of them pay homage to a classic film in the horror or sci-fi thriller genre. There’s the backwoods cabin that’s reminiscent of the one in the Evil Dead series, the “Calamityville Horror” house (whose inspirations should be obvious), and the farm town of Spooky Hollow, complete with its headless horseman (whom you can hire onto your own squad). Even your own Ghost Headquarters is very well-done, and provides an arena for you to spend “gold plasm points” earned on missions to teach your ghosts new powers that they can use in the field. In another parallel to The Sims, the mortals themselves don’t speak in recognizable voices, but instead use an unintelligible brand of gobbledegook that sounds like a cross between the infamous “Simlish” and KITT speaking Cantonese. (Ghosts don’t understand English, I suppose.) Although they sound like harmless insects, these mortals have their own nefarious schemes as well, and as the game progresses, they’ll call in witches, warlocks and even Ghostbreakers (named Ramis, Ackroyd and Murray, I might add) to banish you from their realm. Of course, if you know how to play the mortals’ game, you’ll beat them at it every time. Wendell, busy ruining another sorority girl's evening. The game isn’t without it’s bad points — no game is — and you likely won’t feel any of them until you get close to the end of Act II. It’s occasionally buggy throughout, with sporadic issues involving AI, some of which can become a headache. One mission in particular was tough to complete because the mortals would get stuck and wouldn’t leave the house, meaning I couldn’t meet the objective of scaring everyone away. The worst instance of the insipid mortal AI came later, during a mission where I had to surreptitiously guide a group of mortals to a cabin in the woods. These idiots wouldn’t follow me, resisted my obsession powers and then got stuck on the level geometry when I tried to herd them down the correct path. Eventually I won the mission, but not without a lot of grousing and complaining. Ghost Master was Sick Puppies’ swan song (Empire Interactive didn’t think the game performed well enough, and disbanded the team a year after its release), which is a shame because this is actually a very well-made game, AI bugs aside. It received mixed reviews upon its release in 2003, although several outlets in the mainstream gaming press gave it very high marks. PC Gamer in particular said that Ghost Master was at “the head of its genre” and gave it a 90 out of 100 score. 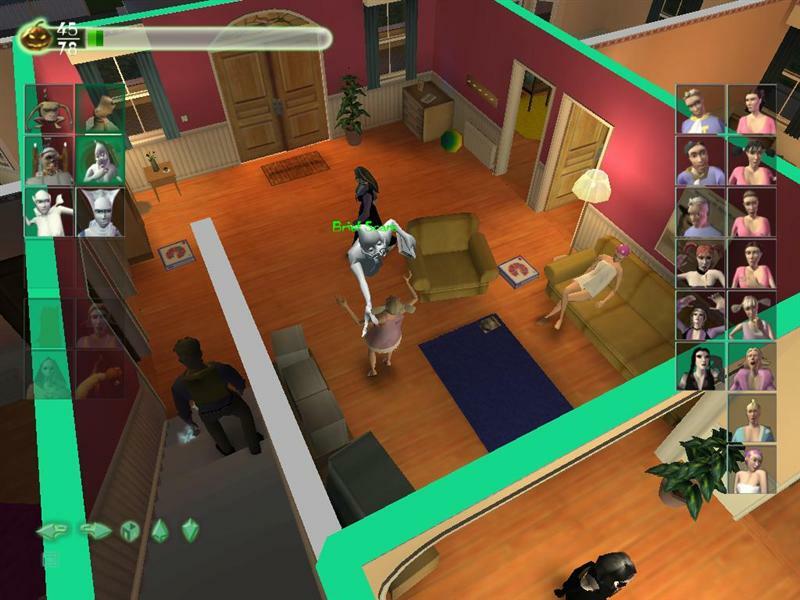 As for me, I’d take it over The Sims any day of the week — or any year of the decade, as might be more apt for this Retro Review. If you see Ghost Master on the used software shelf of the local game shop or in a bin at somebody’s garage sale, I’d advise that you pick it up. It certainly runs great on today’s PC hardware (hell, it even runs fine on Apple’s five-year-old laptop! ), and if this review has intrigued you, you’ll almost certainly get a few days’ fun out of it.